Every Illinois corporation or Illinois limited liability company (or other appropriate business entity) must issue at least one class of stock or one class of membership units, and these shares or units of ownership are considered securities. Accordingly, it is impossible for a business corporation or Illinois limited liability company (or other appropriate business entity), to transfer an ownership interest without implicating the federal and Illinois laws. Business’s may also issue other securities such as options, pre-organization subscriptions, notes or other evidence of indebtedness and investment contracts. An Illinois start-up business attempting to raise capital by issuing securities needs to comply with federal and Illinois securities laws. The federal and Illinois laws require compliance with a complex regulatory scheme measured against high standards. In other words, securities laws are exceedingly complex and technical. To add to the complexity, federal and Illinois laws are not completely consistent with each other, and compliance with the federal laws does not assure compliance with Illinois or other state laws. In addition, a particular transaction may require a business to comply with the securities laws of several states, all of which may be different from each other. The federal and Illinois securities laws require compliance with a complex regulatory scheme measured against high standards. 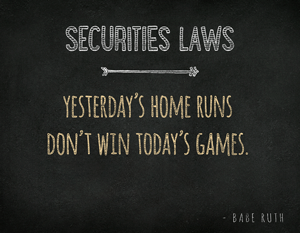 In other words, securities laws are exceedingly complex and technical. Because of the uncertainty and expense that the securities laws add to transactions, the application of the securities laws should be addressed in the earliest business planning stages of any business organization or business transaction.